July 1 is a very important holiday for the Canadians. 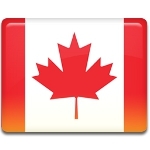 This is Canada Day, that is often regarded as Canada's birthday. Canada Day celebrates the enactment of the British North America Act of 1867 that united three separate British colonies into a single country called Canada. This holiday was originally called Dominion Day, but it was renamed in 1982, when the Canada Act was passed. The holiday is celebrated nationwide and by the Canadians living in other countries. Although Canada Day is the major holiday for the country, it has no specific or standard celebrations. The parades, outdoor public events, maritime shows, carnivals, festivals, musical concerts, fireworks and barbecues are common. The major celebrations are organized in Ottawa, the capital of the country, and Ontario and they include free large concerts and cultural displays. Annual celebrations of Canada Day take place in other countries. Since 2006 Canada Day has been held at Trafalgar Square, where Canada House is located. Since 2013 the holiday has expanded to New York City and a program of music, food and street hockey is held in Central Park.